During the evening hours of December 21, 1956, Officer Latvis was riding in the Nashua Police Ambulance responding to an emergency call for an injured woman. As the ambulance approached the intersection of West Pearl and Chestnut Streets it was hit in the rear by another automobile, causing the ambulance to spin around and careen into a utility pole. The force of the impact caused Officer Latvis to be thrown from the ambulance. He sustained a fractured skull. 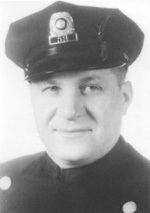 Officer Latvis was rushed to Memorial Hospital and then to the Deaconess Hospital in Boston where he died the next day. Officer Latvis was 38 years old at the time and a four-year member of the Nashua Police Department. He was survived by his wife and two children.